Google AdWords — the company’s online advertising program — helps businesses reach new customers based on keyword searches. 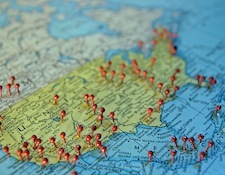 Recently, the company expanded its program and now offers better targeting through location. Ads purchased through AdWords are displayed to people who are searching for the kinds of products and services you offer. For example, if someone searches for “gluten-free cupcakes in Chicago,” your ad could appear in the search results. The updated location targeting gives you the ability to target more than 30,000 zip codes — meaning that you specify which geographical areas you’d like to focus on down to the neighborhood. You can add up to 1,000 zip codes at a time, and you’ll also be able to view campaign performance stats for each one. An additional update, Location Insertion, enables advertisers with multiple locations to create one ad, and AdWords will automatically insert the city name, postal code, and phone number for the appropriate location when the ad is displayed. Google also made some tweaks to existing features, specifically its advanced location targeting. Previously, if someone in New York searched for “flights to Las Vegas,” targeted New York ads wouldn’t appear since interested appeared to be focused on Las Vegas. Moving forward, you can now select “People in my targeted location” to show ads to people in that location, regardless of what the search query indicates. And finally, Google updated the location signals used on its Display Network. In the past, Google only used the physical location of the individual performing a search. Now, the search giant will also look at the content on the page — assuming it’s tied to a specific location — and target ads appropriately. While the later two changes benefit those in the travel industry, all of these updates can come in handy when building an advertising campaign for your business.